Challenge targets. 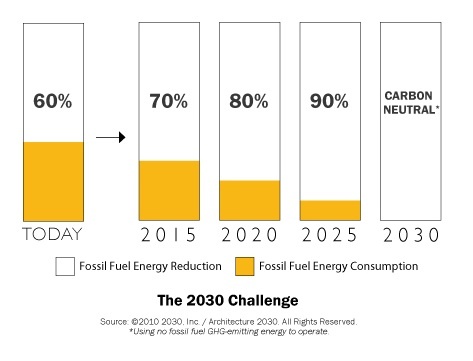 Based on 2030 Challenge goals for residential and commercial design and construction include slowing the growth rate of greenhouse gas emissions, which will mean reducing fossil fuel usage in buildings by 70% by 2015, 80% by 2020, 90% by 2025, and to zero by 2030. 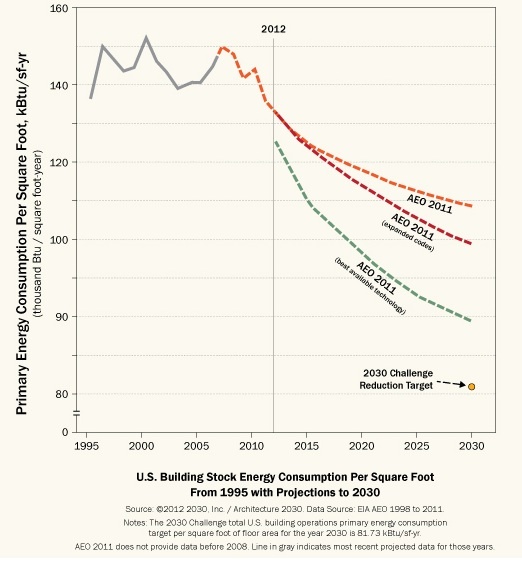 Image Credit: Energy Information Administration via Architecture 2030 The U.S. Energy Information Administration’s Annual Energy Outlook projections for 2005, 2007, 2009 and 2011 that estimates of residential and commercial building energy use to 2030 have dropped by almost 70% since 2005 as the building sector improves building design and energy efficiency. 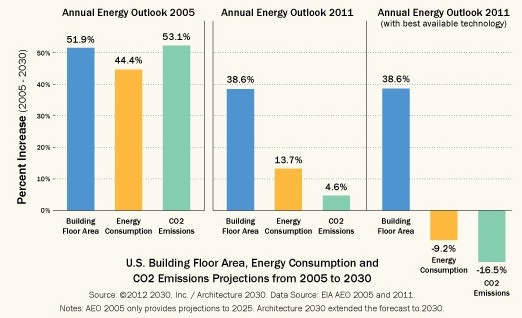 In 2005, the AEO forecast an increase in total U.S. building floor area of 51.9% from 2005 to 2030, with energy consumption and CO2 emissions increasing by 44.4% and 53.1% respectively. The AEO 2011 projects a building floor area increase of 38.6% over the same time period, and dramatically lower energy consumption and related CO2 emissions. Improved building design and efficiency has put the 2030 Challenge energy reduction target within reach, Architecture 2030 says, though the design industry still has to persevere to reach the Challenge’s zero-carbon goal in 18 years. 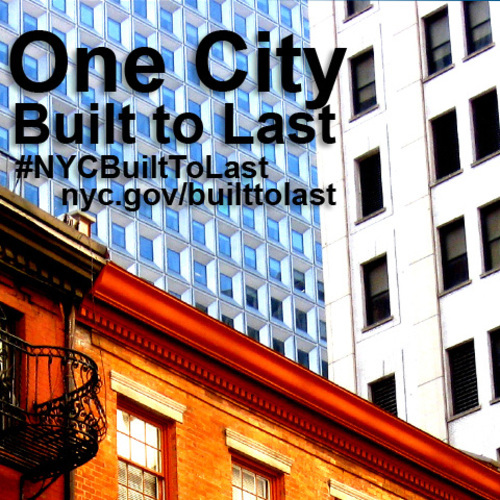 Back in May 2007, major building-design industry groups agreed to a benchmark against which they could measure progress toward their goal of increasing energy efficiency and reducing carbon emissions in residential and commercial buildings. That initiative, known as the 2030 Challenge, is supported by the American Institute of Architects, the American Society of Heating, Refrigerating and Air-Conditioning Engineers, a nonprofit group called Architecture 2030, the Illuminating Engineering Society of North America, and the U.S. Green Building Council. With the benchmark established, these groups were then able to more effectively focus their design expertise on their ultimate goal: producing buildings that, by 2030, will be carbon-neutral. The baseline identified by the benchmark agreement is the national average of energy consumption of existing U.S. commercial buildings as reported by the 2003 Commercial Building Energy Consumption Survey, whose data are a set of whole-building (rather than source) energy-use intensity measurements, in kBtu per sq. 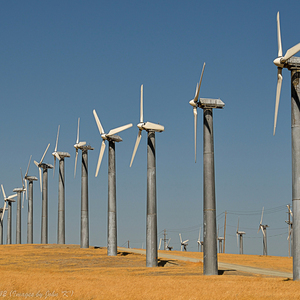 ft. per year, gathered by the Department of Energy’s Energy Information Administration. This week, Architecture 2030 cited projections by the EIA that suggest the efforts of the industry groups are beginning to pay off. In what the EIA calls its Annual Energy Outlook, estimates of residential and commercial building energy use from 2005 to 2030 have dropped by almost 70% as the industry groups improved building design and performance. The most recent AEO estimate indicates Americans will spend $3.66 trillion less on energy between 2012 and 2030 than was originally projected in 2005. If, by 2030, the industry deploys the most efficient building technologies available, these savings will top $6 trillion, AEO data show. 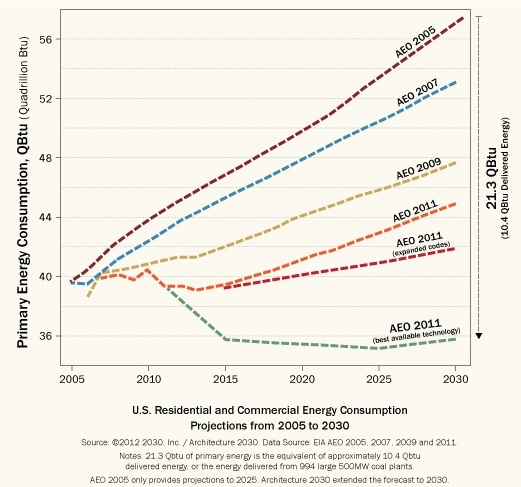 The AEO forecast provides another perspective on 2030 Challenge prospects by looking at the expected increases in total U.S. building floor area, projected in 2005 to be 51.9% by 2030, with energy consumption and CO2 emissions increasing by 44.4% and 53.1% respectively. AEO 2011, however, projects building floor area to increase by 38.6% through 2030 and energy consumption and related carbon emissions from buildings, if the best technologies are applied, to drop below 2005 levels. The point is, the AEO data show it is realistic to make carbon-neutral buildings – which use no fossil fuel or greenhouse-gas-emitting energy to operate – the standard by 2030. And that is the 2030 Challenge’s primary goal. 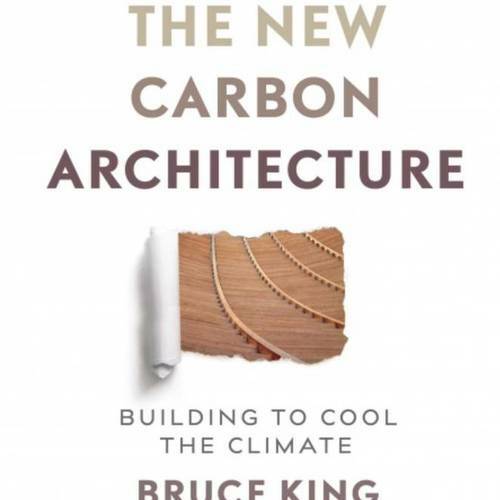 There are a number of ways for designers and builders to reach that goal, and renewable-energy sources can be part of the plan, but the first priority, Architecture 2030 notes, is to meet energy reductions by constructing buildings that are energy efficient and make the best use possible of solar orientation, daylighting, passive heating and cooling strategies, and energy efficient mechanical equipment. In any case, Architecture 2030 hope AEO 2011’s encouraging data motivate Challenge participants to forge ahead.